The principle of the Klein Lindner hollow axle. adjustable axle without the fuss of having a swivelling truck with the associated steam tightness problem of the live steam tubes. They developed an axle which looks complicated but is essentially stunningly simple. In fact the axle consist of one solid axle which transfers the drive forces from conventional drive rods via a ball-and-pinion system to a hollow axle which connects the two wheels. The outer hollow has enough room to swivel. 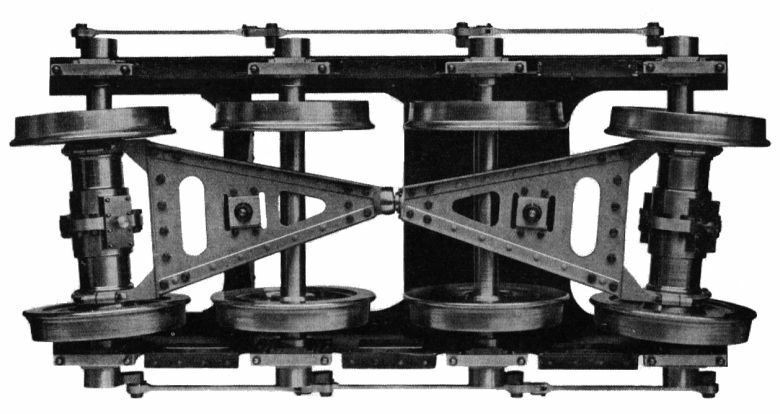 Two such axles were often interconnected to ensure smooth riding properties. The Klien Lindner system remained rather inconspicuous in locomotive history. Undeservedly so, as it was one of the more intelligent solutions to the articulation problem. So much so that it would have been a serious competitor to the Garratt and Mallet forms of articulation. Four fixed axles between two Klien Lindner axles would result in an equivalent of any x-6-x+x-6-x or x-6-6-x arrangement and it would have been perfectly capable of negotiating the same tight curves. Proof of its relative success may well be that the Klien Lindner continued to be built for European railways long after orders for articulated locomotives had dried up. In some cases the Klien Lindner type even actually replaced preceding articulated designs. In many publications it is mentioned as being hard on maintenance. Admittedly the fully enclosed ball-and-pinion system between the frame plates, a place hard to get by, would have given some difficulty in repair. But the system was fully enclosed making it much less prone to damage and dirt. And never forget that the pivots of other articulated were by no means easier to maintain. First I think this comparison is applicable only if you compare the Klien Lindner locomotive with a conventional locomotive with the same wheel arrangement. Never forget that a conventional locomotive is always preferable over an articulated whenever possible for simplicity and lesser costs. Articulation is always the second best option. Second L. Wiener describes the Klien Lindner form as a serious competitor to the other types of articulation. Overall the Klien Lindner articulation is much simpler than having pivots taking up much of the locomotive's stress and flexible joints in steam pipes that tend to leak. Third is the simple proof of capitalism: the Klien Lindner was built by the thousands even in the relatively small area were it was used. It is very American to think "it was not used here, so it can't be much good". It wás good but its main manufacturer, Sächsische Maschinenfabrik Chemnitz, failed to open up the lucrative export market, so its use was restricted to mainly Germany and Austria. 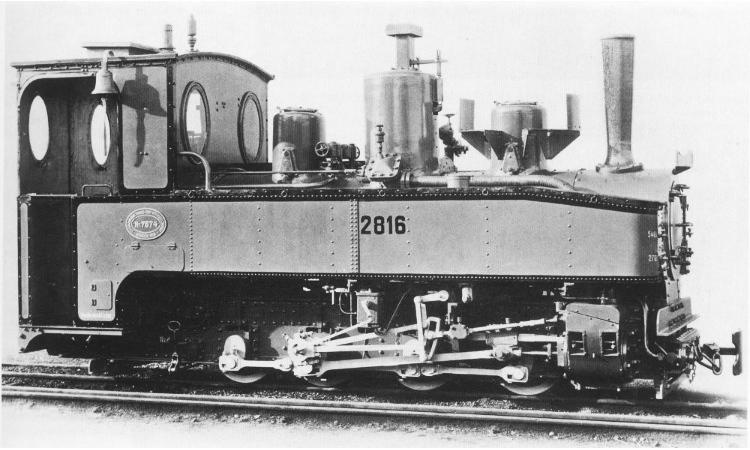 Many of the locomotives of the German Army were Klien Lindner. Manufacturer photo of Krauss Maffei. 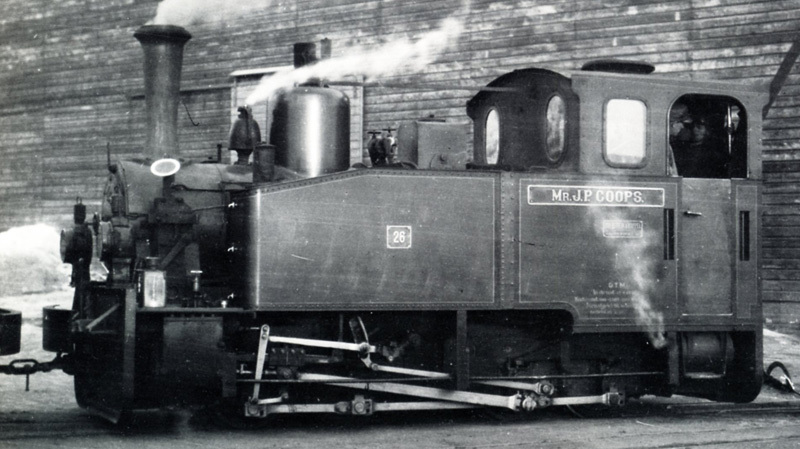 Of this Feldbahn type alone some 2,500 were built, making it the second most numerous articulated locomotive in the world, after the Mallet. Austrian narrow gauge steam locomotive Kh.101 in Weiz station on the Feistritztalbahn, Styria. The rear axle is a Klien Lindner construction. 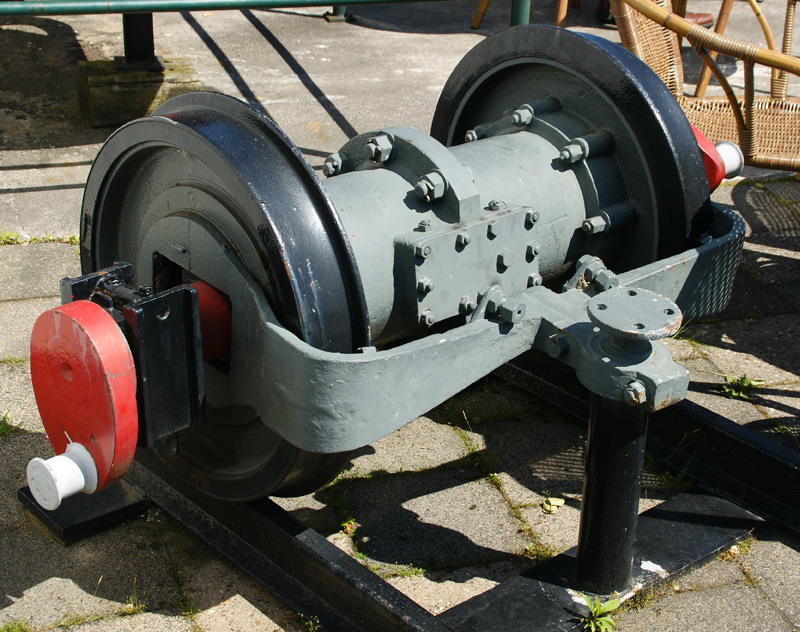 The only surviving artefact of the already poor Dutch articulated history: a Klien Lindner axle of one out of four tramway locomotives of the GSTM, built in 1913 (2) 1923 and 1929. Photo taken by me in 2009, at SHM museum railway.